Wednesdays, 6:30 – 9:00 pm, March 20 – May 15. Hand tool woodworking is not solely reserved for nostalgia and romanticism. When compared with modern machine woodworking, a fully equipped hand tool shop could occupy no more space than a workbench and small tool chest. There are also the added benefits of being quiet, no electrical requirements, and virtually dust free. 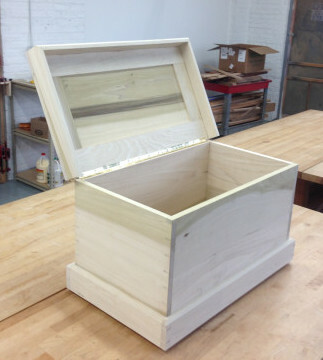 In this class you will learn about the basic hand tools, setting and tuning them, and their use while making your own Joiner’s tool chest which can hold a complete set of hand tools while still being able to fit on top of a work bench. In this class we’ll be using hand planes, saws, chisels and scrapers. A few of the topics you will learn include dovetails, mortise and tenon joints, frame and panel construction and much more. The term “Joiner” refers to craftsmen prior to the Industrial Revolution who were specialists in fields of finish carpentry; sash windows and doors, fine furniture, cabinetry etc. You will need additional time outside of class to complete your project. Students may attend open shop on Saturdays, or work at home if possible. It is recommended that you dress expecting to get some sawdust, glue or varnish on your clothing.